Review: I have really mixed feelings about this book. I love what it says about addiction in teenagers, about loyalty to family and about the different ways that grief can affect you. However the book itself really dragged for me. I didn't feel invested in the characters for some reason. I did really want to know how it all panned out and so I was always going to finish it but it took me a while to do so and I did pick up other books in the mean time. Harley is a likable character in the most part. She isn't particularly rebellious but still likes to go out and have a good time with her friends like a lot of young people. She has a difficult relationship with the people in her family including her sister who is in the hospital. We see her go through a break up at the start of the novel which would usually make me feel sorry for a a character but I didn't really sympathise with her a great deal because of this dishonesty that surrounded the break up and her what it had to do with her sister. Cassidy was a character I really enjoyed getting to know over the course of this novel and someone I would love to find out more about in a spin off novel or sequel. She and Harley have a lovely relationship that reminded me of mine with my best friend. There is also a budding romance in this novel which again I kind of felt luke-warm about. I was excited to see it happen but I could also see that it was at the wrong time for the characters and I feel like it got very serious and very dependent very quickly so I really would like to see where this went when the novel ended. As I mentioned, this book deals with addiction, grief, peer pressure and also a little bit of body positivity,. The body positivity seemed to come out of left field all of a sudden, I would have liked to have seen more of that in this novel or else for it not to have been mentioned. 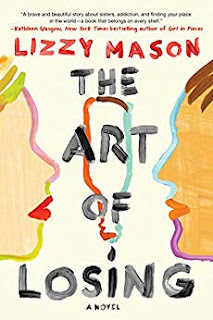 I do think that this book shines a light on addiction in teens and how it can affect different people in different ways. How there isn't a one size fits all approach to treatment and I think that this is something that isn't shown enough in books, particularly in YA. Overall I enjoyed this book but the pacing was a little slow and there were a few problems with it that I struggled to get over. If you are looking to read about teen addiction then I definitely think that this book would be good to pick up. If you are just looking for a strong contemporary young adult novel then I would give this one a miss.